I don't know if i should call this Kerala style rasam or just my moms rasam . All my aunts prepare rasam in this way too.I love all kinds of rasam but specially this one because it is quite different in taste from all the others and sometime a very welcome change.Goes very well with rice but i like it on upma too very weird ha. And this is what my mom used to make for us when we were kids as pani puri pani as she didn't want us to eat pani puri outside at street vendors but know i know this is not authentic pani puri pani :) but still love it with pani puri. I recently downloaded picasa and this is my first try at collage.Anyways now lets move to the recipe . 1. Heat oil and add hing and mustard seeds. 2. When mustard pops add curry leaves and onion. 3. When onion turn transparent add ginger and garlic. 4. When everything turn light golden add turmeric,chilli,coriander . 5. Cook for a minute and add 2 cups of water. 6. Add black pepper and salt and let it boil. 7. Mash the soaked tamarind and add 1/4 cup water and pass through a sieve. 8. Add the 3/4 of the tamarind extract to the boiling mixture . 9. Add jaggery to the mix and let everything simmer for few minutes. 10. Taste and adjust the sourness by adding more tamarind extract . 11. And let it simmer for at least ten minutes. 11. Serve with warm rice and papad. 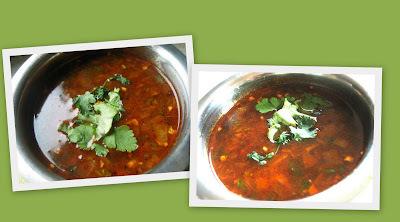 ooh the rasam is great.. Love the way it looks..